The Waffle House Museum in Avondale Estates preserves the world’s first Waffle House location just as it looked in 1955. Photo by Lauren Ramsdell. The sign says “Good Food Fast” but you won’t find any cooks slinging hash behind the counter. No T-bones sizzle on the flat top, no syrupy smell infuses the air. Instead, this Waffle House has been preserved as it was in 1955, the very first Waffle House ever, as a museum to the South’s ubiquitous breakfast restaurant. If you blink, you’ll miss it. On East College Avenue, right on the border of Decatur and Avondale Estates, the museum sits shuttered most of the time with just an old-fashioned “syrup-style” sign directing you in. The museum is open quarterly for public tours, or, potential guests can call Waffle House communications and they’ll schedule a tour. The next quarterly opening is the first weekend of September. Back in 1955, founders Tom Forkner and Joe Rogers Sr. were good friends but not yet in the restaurant business. Avondale Estates was still a stop on the way to Atlanta but didn’t have a 24-hour diner of its own. Rogers worked for Toddle House, a breakfast-all-the-time restaurant with a concept similar to Waffle House but couldn’t convince corporate that Avondale Estates was the place to open. 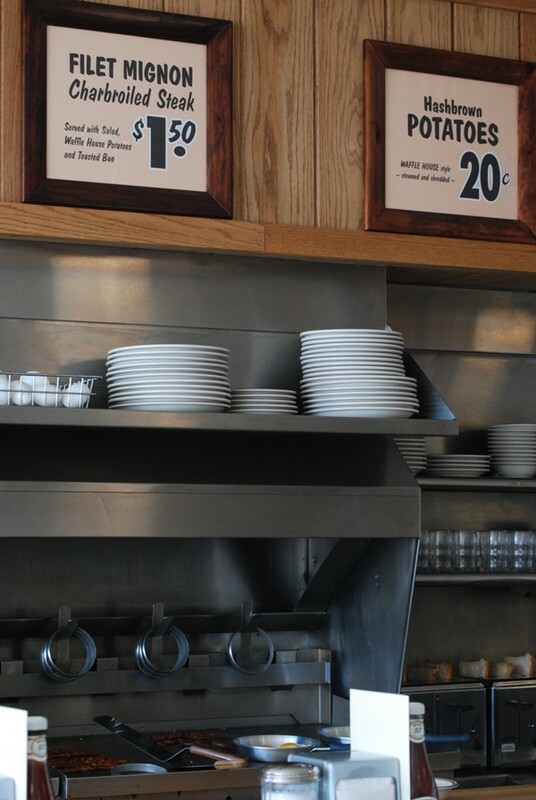 Rogers approached Forkner with the concept for what would become Waffle House: a round-the-clock diner featuring an open kitchen with just a few steps between customers and their food. It should take an average of seven minutes from order to first bite. Forkner contacted his brother, John, who built the iconic “shoebox” building that still stands today: a long, narrow rectangle with kitchen in the middle. Forkner and Rogers filled the menu with made-from-scratch classics: $.30 hamburgers, $.20 fresh-baked slices of pie and, of course, waffles for $.40. For Waffle House’s 50th birthday in 2005, the World of Coke put together a recreation of the high counter where patrons used to order. Originally scheduled to be completed that same year, the museum was not quite finished and opened instead in 2008. At the museum, only the floor is completely original to the building, but most everything else is as close as they could get. The founders didn’t think in 1955 they’d establish a chain with more than 17,000 franchises, so there aren’t actually a lot of pictures of the original Waffle House. So why a museum? Thrasher estimates the museum draws two to three groups by appointment in the summer months, as well as school groups throughout the year. Many are startled that something as ubiquitous as Waffle House–pass any exit ramp in the South and you’re likely to spot that blaring yellow sign –started in a little suburb of Atlanta.